As has been my tradition, every sermon that I preach will be posted here. This sermon, Worship as Lifestyle, was given at The Salvation Army Devonport on Sunday 15 November, 2015. The Reading was Mark 13:1-13. Hear Ye! Hear Ye! 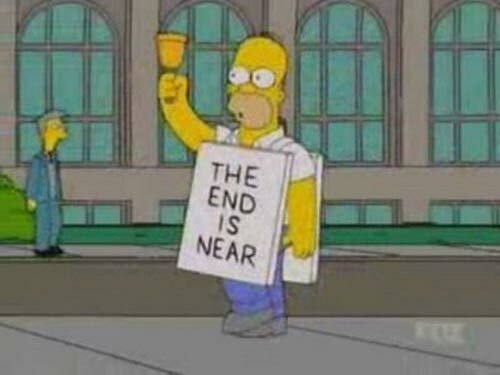 The End is near! War is upon us! Syria is rising up against the world! Russia and the United States are arguing. Israel and Palestine! Earthquakes all over the world. Famines through Africa. A shortage of Baby Formula in China. Donald Trump being an US Presidential Candidate. Starbucks not putting Merry Christmas on their coffee cups. Bunnings rising up next to K&D. These are the end times people! Jesus is coming! Look Busy! As the human race, we seem to have an addiction to wanting to know when the end of the world will happen. The Great Fount of All Knowledge, Wikipedia, lists 168 Apocalyptic predictions, dates when various people have predicted the end of the world would happen. There are also 13 future estimates currently listed, including three scientific predictions over when the earth will no longer be habitable. Some of these predictions, we seem to laugh at – such as Harold Camping, who had six attempts at predicting the end of the world. But others are from people that we respect, such as Sir Isaac Newton, John Wesley, founder of the Methodist Church from where The Salvation Army traces its lineage, and Martin Luther, the man who started the Reformation. Author Ben ClaptonPosted on November 16, 2015 May 25, 2016 Categories faith, SermonsTags Christ, christian, christianity, Church, faith, God, gospel of mark, jesus, Jesus Christ, Mark, Prayer, Religion and Spirituality, Salvation Army, The Salvation ArmyLeave a comment on End times?